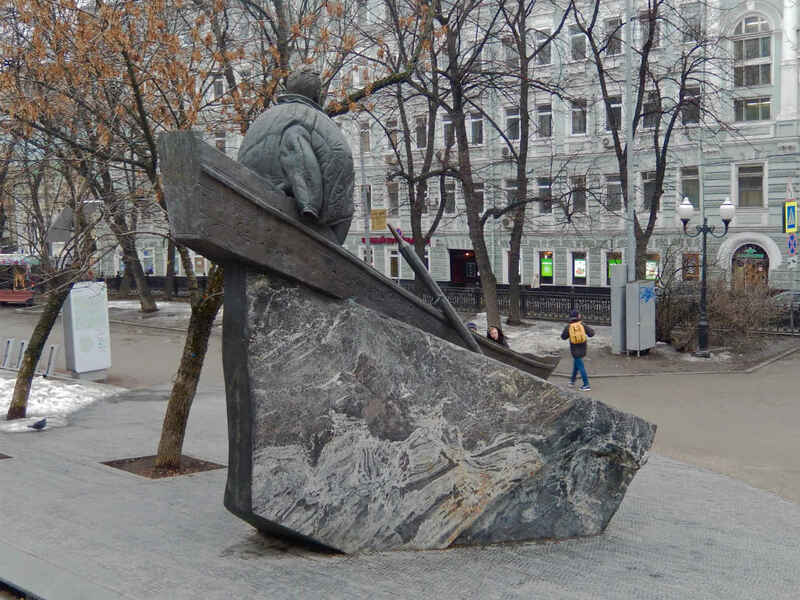 I have been photographing this monument to Mikhail Sholokhov, the Nobel Prize-winning author who claimed to have written the classic Soviet novel The Quiet Don, for several years now. I have never liked the photos I got. Often it was a problem of light – I usually happened upon it on very sunny days when I got nothing but black shadows and burned-out white spots. But there were other problems, too. One is the monument, which is sprawling and multifarious and, therefore, difficult to get an angle on. Another is the figure of Sholokhov. Controversial is no longer the word for him – it now seems certain that many will continue forever to call him a fraud -still another of those frauds, like the Stakhanovite shock workers or the child hero Pavel Morozov, none of whom actually existed, at least as the stories were told about them. 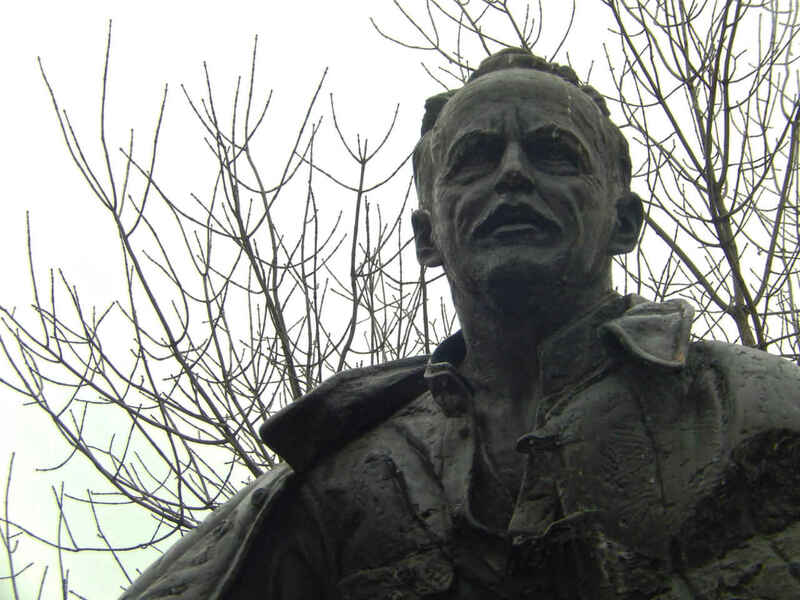 Sholokhov may well have been one of those heroes that the Soviet state needed, but didn’t have, so chose to make up. And he turned out to be willing to play the part – why not? – it made him rich, famous and powerful. Rumors, and not only rumors, have long posited that a certain Fyodor Kryukov, a soldier who was killed during the Russian Civil War, wrote most of The Quiet Don (English publishers traditionally have cut this work into two, And Quiet Flows the Don, and The Don Flows Home to the Sea). Over the decades other authors, or partial authors, have been put forward, including Alexander Serafimovich (who denied he wrote the novel). 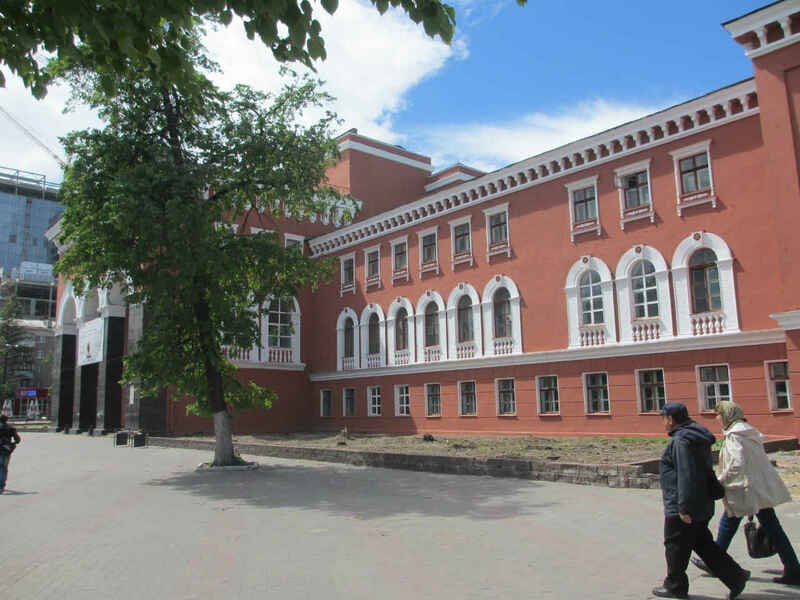 The 1999 discovery of the manuscript that Sholokhov first submitted for publication at the end of the 1920s gave support to those who believe in Sholokhov’s authorship. It was clearly determined that 605 of the 885 pages were written by Sholokhov, while the remaining pages were written by his wife and her sisters. 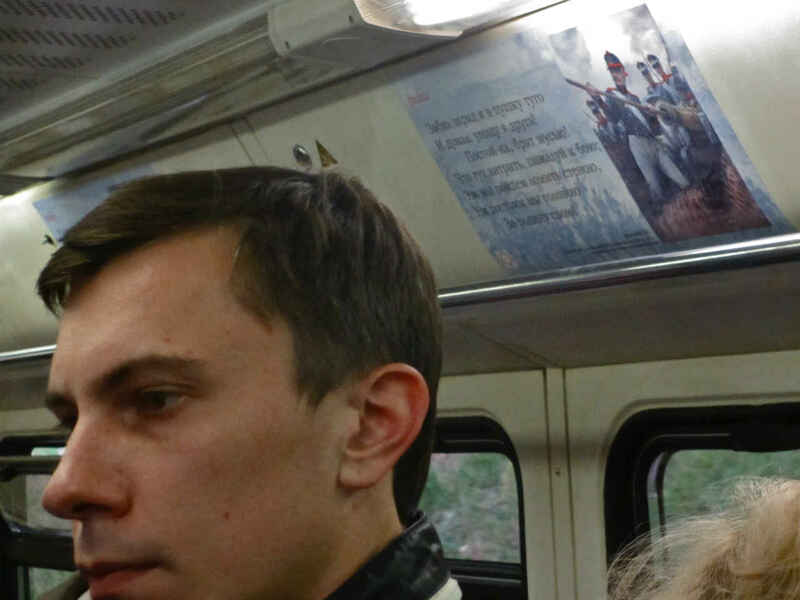 And yet, the doubt that hangs over Sholokhov’s head is just too serious to be dismissed. After all, who is to say that Sholokhov and his wife didn’t merely copy out Kryukov’s, or someone else’s, abandoned text? A highly detailed article about the controversy on Russian Wikipedia lists 17 serious accusations that have never been successfully refuted. It lists 10 detailed reasons to believe that Sholokhov wrote the novel. I am no expert in this topic, which, as the Russians say, could easily make the Devil himself break a leg trying to maneuver the details. I did have the memorable, though, ultimately inconsequential, experience of once working with a TV producer who came from the Don region, knew the people there, the stories, the reality, and who passionately, even vehemently, supported the version that Sholokhov was a plagiarist. Sholokhov was recently in the news again when the archives of the Nobel Prize Committee for 1965 – the year he won – were made public. You can read some details in an article in The Guardian, but here are a few tidbits: Writers passed over in favor of Sholokhov included Vladimir Nabokov, Anna Akhmatova, Konstantin Paustovsky, Pablo Neruda, Jorge Luis Borges, Somerset Maugham, Samuel Beckett and several others. Although records show that the choice of Sholokhov was unanimous, it was, according to a piece published by Colta.ru, far more controversial than it would appear at first blush. At one point a suggestion to give the Prize jointly to Sholokhov and Akhmatova appeared to gain traction. It was apparently shot down by Professor Anders Esterling, who declared, with some reason, that such an award would be pointless since nothing, other than their native tongue of Russian, unified the two writers. 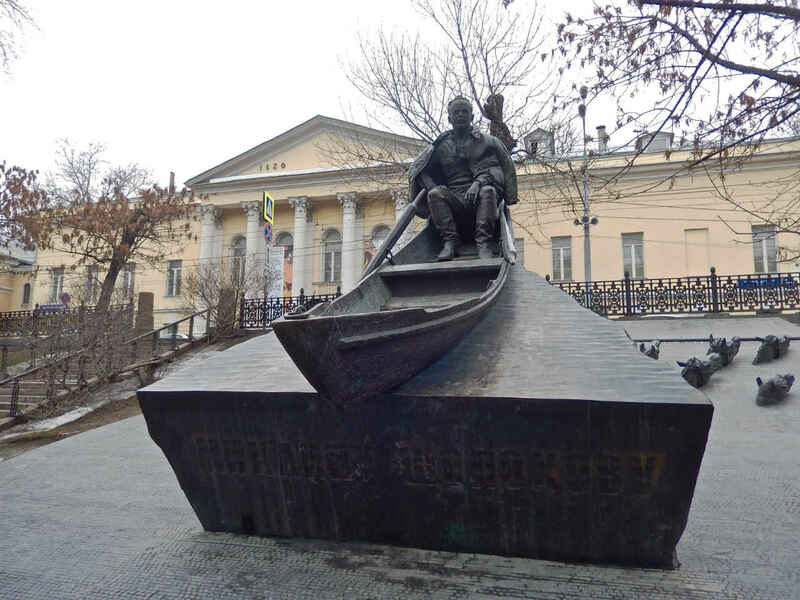 This monument, conceived by Iulian Rukavishnikov several decades ago, but eventually created by his son Alexander Rukavishnikov, and unveiled May 24, 2007, was the second monument honoring Sholokhov to be erected in Moscow. It has been – like its subject – controversial from the very start. 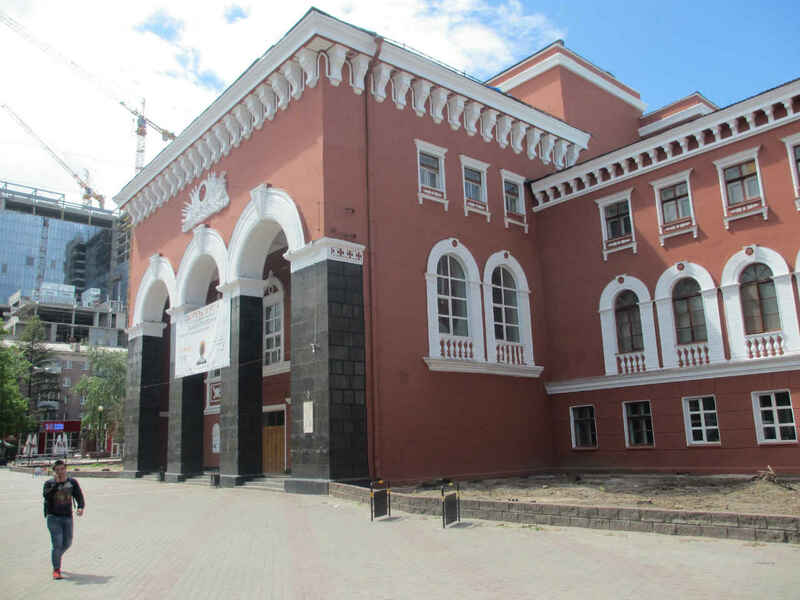 It is located in the garden walk area of Gogol Boulvard immediately across from house No. 10, where Ivan Turgenev occasionally lived. 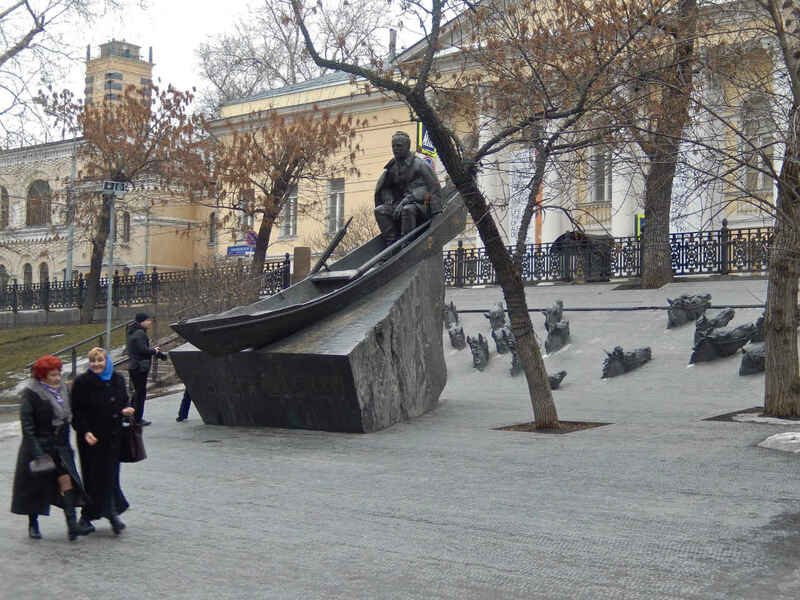 Many felt that if any monument were to go up here, it should have been one honoring Turgenev. 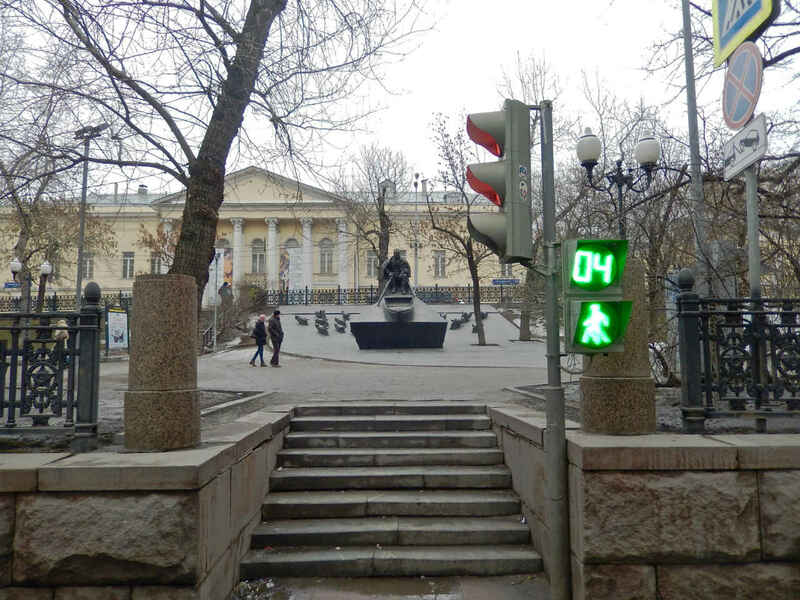 This is not, however, a fully arbitrary location for the present sculptural group, as Sholokhov lived for many years on Sivtsev-Vrazhek Lane, which runs perpendicular to Gogol Boulevard right in front of the monument. 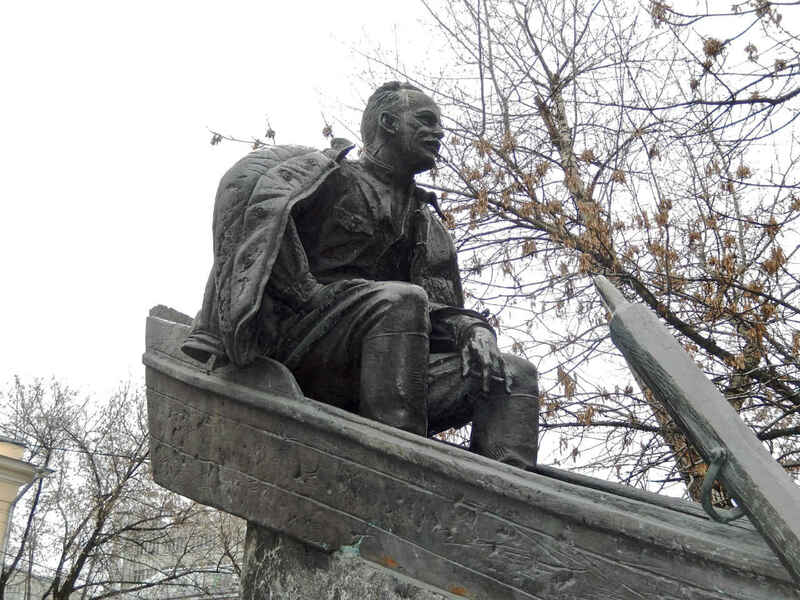 Sholokhov, sitting in a boat presumably navigating the Don River, looks directly down the street where he lived. 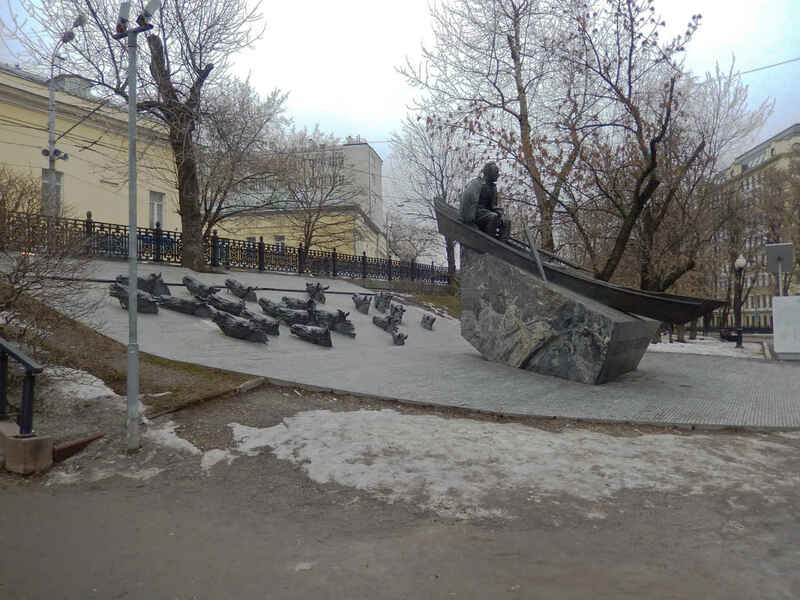 Behind him is a fountain – which doesn’t always have water flowing in it, and certainly did not on the sub-freezing day I photographed it – that shows horses fording the river in the opposite direction from Sholokhov (who appears to be letting the boat float where it will as he poses for the sculptor). 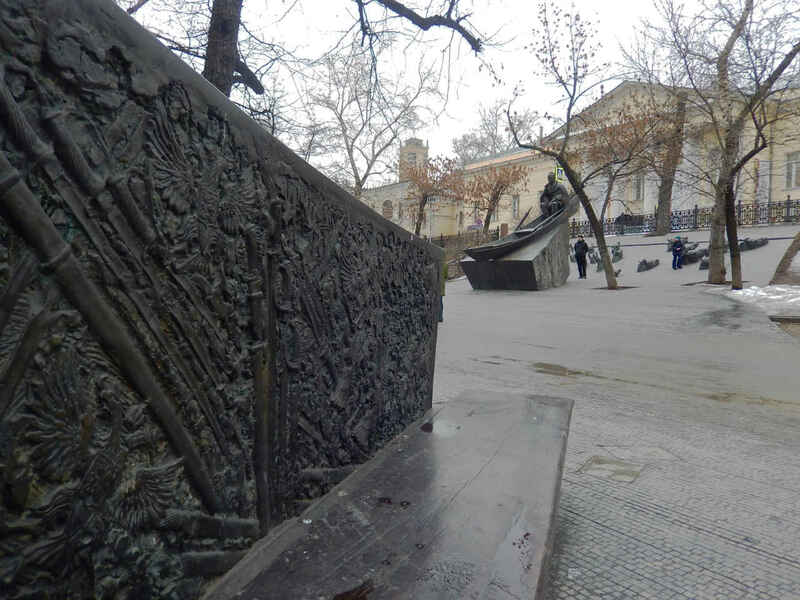 Across the walkway there is a two-sided bench, the backs of which bear symbolic images important to the Cossacks, the main characters in The Quiet Don (such as sabres and the Russian symbol of the two-headed eagle). 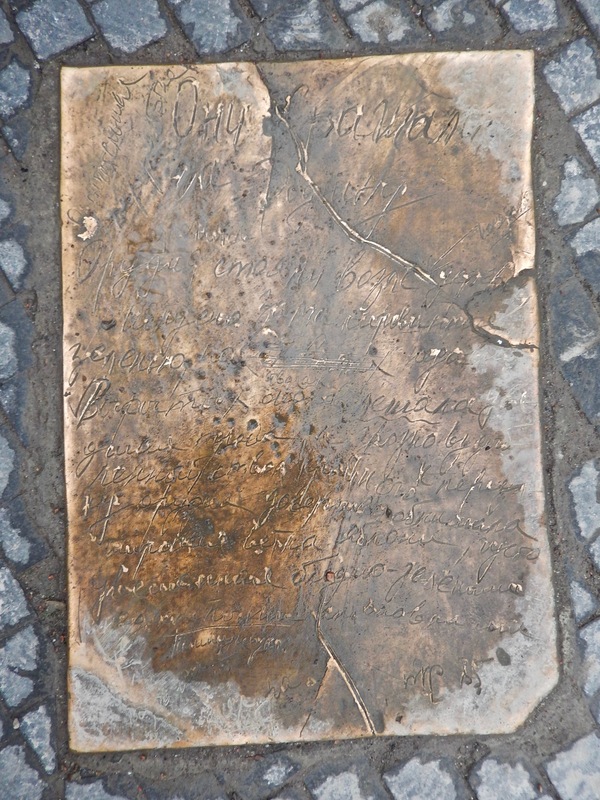 Scattered around in the walkway around the benches are bronze imitations of stray sheets of manuscripts. The one I provide here (the second-to-last photo below) is of the title page from Sholokhov’s other famous novel, They Fought for their Motherland. 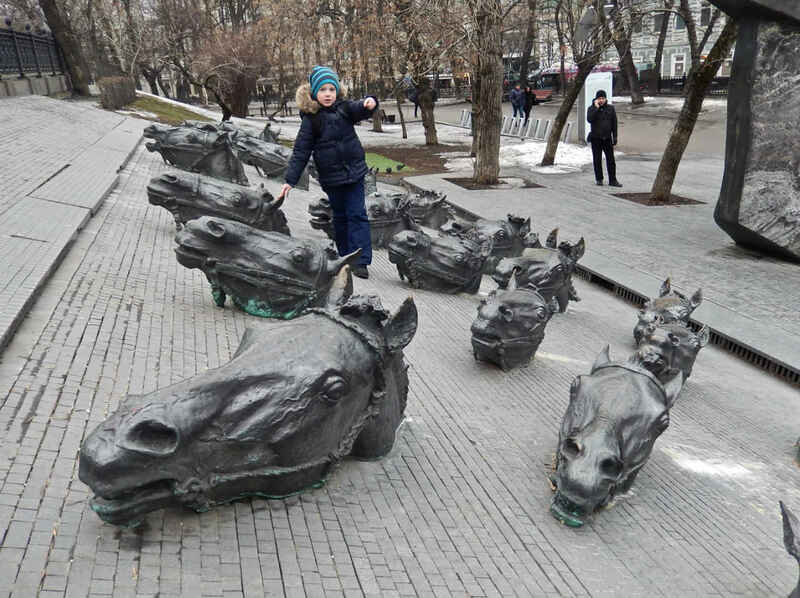 You can’t help but wonder if this is the sculptor’s sly idea of a way to acknowledge the legend that Sholokhov came upon “his” Quiet Don as an abandoned manuscript. 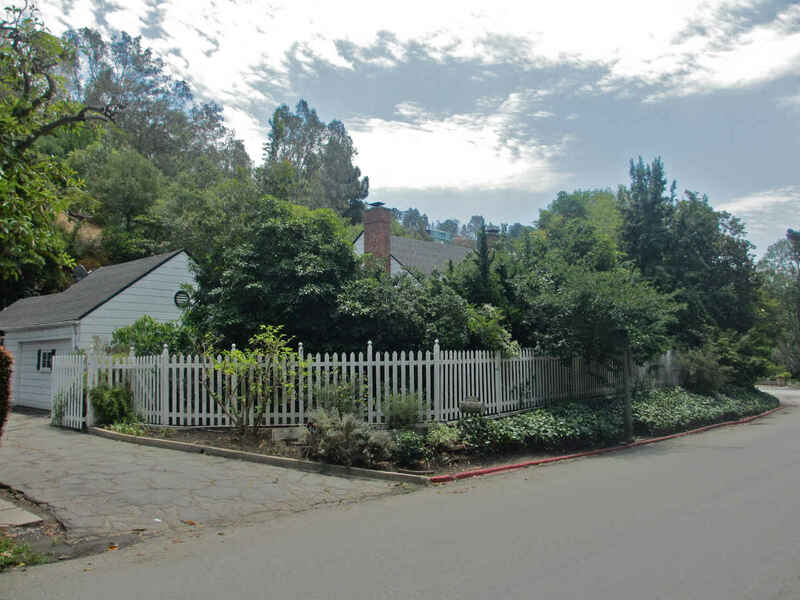 I’m not exactly sure where Alla Nazimova lived at 1000 Stone Canyon Rd., Bel Air, CA, but she did stay here for awhile in the 1920s. I can’t help but wonder if the guest house she occupied is what apparently is now a garage. It would make sense. 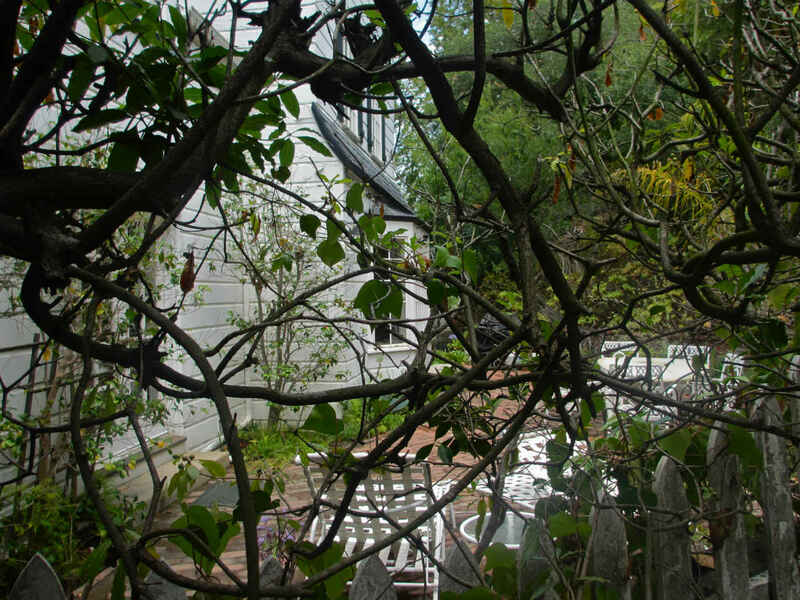 All the more so, since this house, pushed up against a densely wooded hill, seems to have no other place where a guest house might fit. 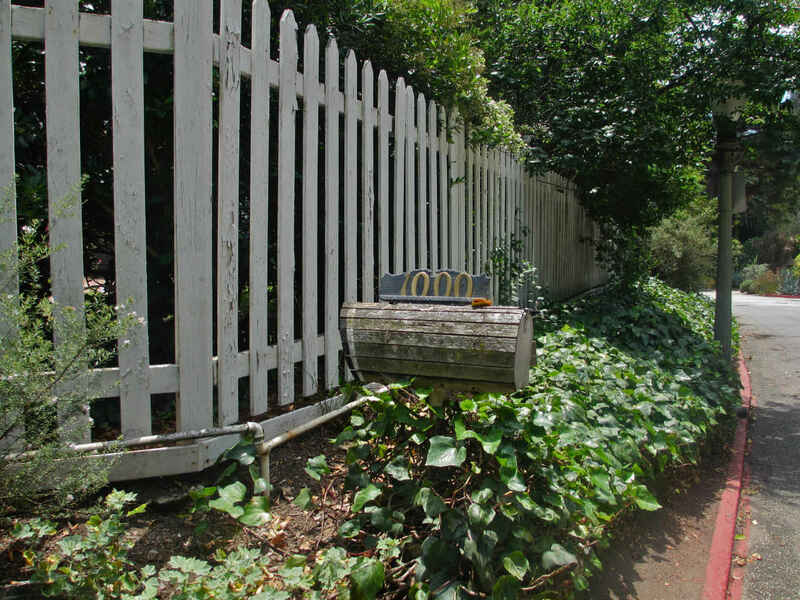 This, one of Los Angeles’s most exclusive neighborhoods, has been home to dozens, if not hundreds, of famous people over the last century. Just a few include: Betty Grable, Judy Garland, Greer Garson, Howard Hughes (whom Ava Gardner once attacked and nearly killed with a bronze statue after he slapped her to the floor in his home down the street at 1120 Stone Canyon), Kareem Abdul-Jabbar, Steven Stills, Marvin Gaye… and we could go on seemingly forever. Most sources tell us that Nazimov stayed in a home belonging to Hollywood musical director Morris Stoloff, a three-time Oscar winner, but I wonder about that. Stoloff, who obviously had Slavic or Jewish Slavic roots, though he was born in Philadelphia, did not really achieve great success until the mid-1930s, when he became the music director at Columbia Pictures (1936, to be exact). Would he – in his early-to-mid-20s, just starting out in his career – have had the money to purchase this exclusive residence? Sure, it wasn’t as exclusive in the 1920s, but still, this somehow doesn’t add up. 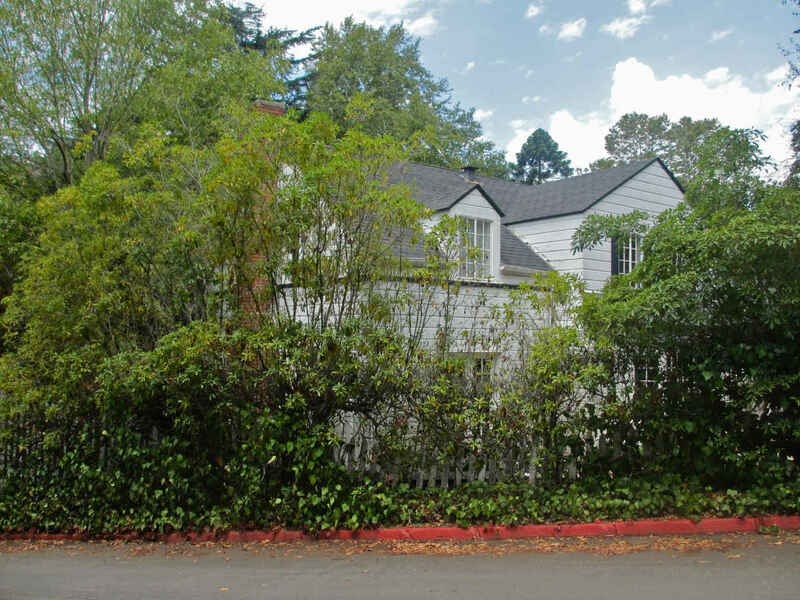 I can only assume that the home has now become associated primarily with Stoloff, so that mentions of Nazimova staying here are automatically connected to what would have been his later residency. 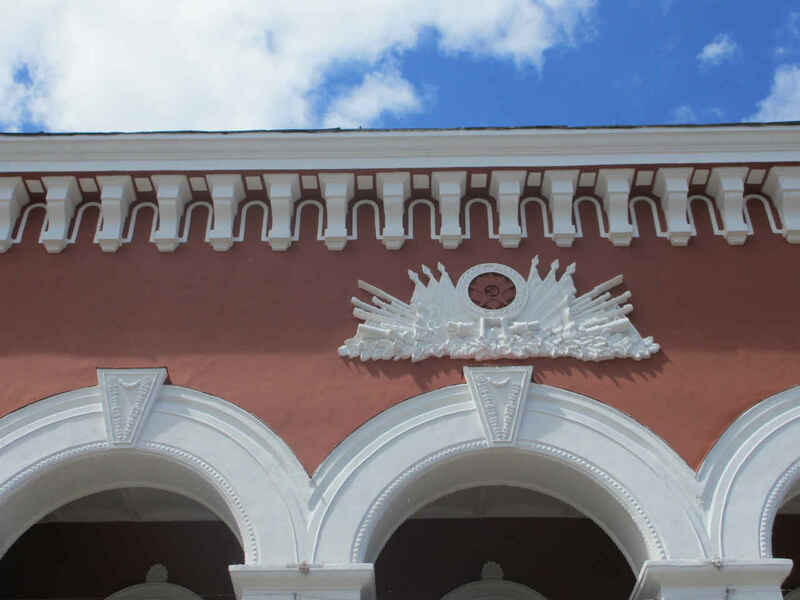 In any case, we know that Nazimova, one of those “refugees” from the Moscow Art Theater who made a career in Hollywood, stayed here at least for awhile when she was at, or close to, the peak of her career. 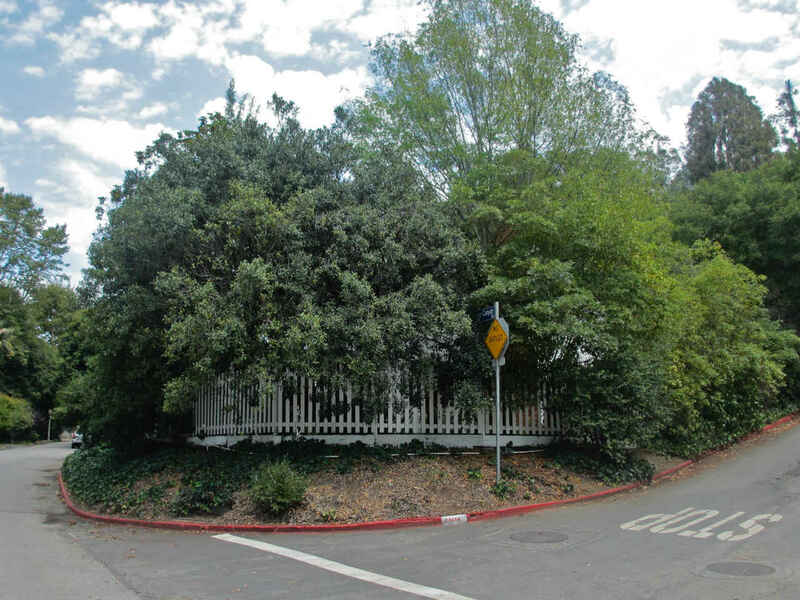 Since she occupied a guest room, and since her famous, even notorious, Garden of Allah hotel on Sunset Strip was still being rebuilt between the years of 1918 and 1926, one can conjecture that her time on Stone Canyon Rd. was just a way station for her. It’s possible that she stayed here, waiting until she could move into her new, bigger property. Nazimova (1879-1945) was born in Yalta with the Spanish name of Marem-Ides Leventon (her earliest-known ancestors apparently left Spain in the 16th century). Her Russian name was Adelaida Yakovlevna Leventon. She first used the stage name of Alla Nazimova when appearing at the Art Theater, on whose stages she performed from its very founding in 1898. Most of the time she played small roles under Stanislavsky and by 1903 -04 she began to feel the pull of destiny. 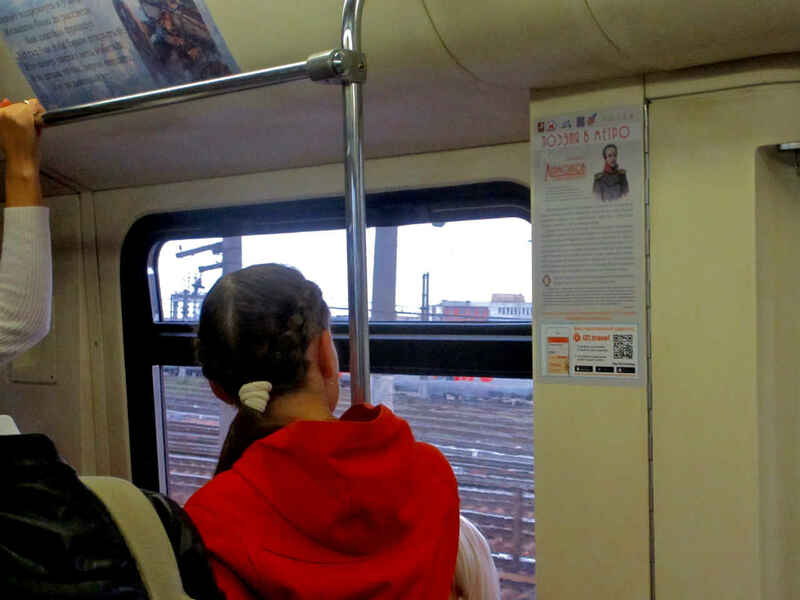 She traveled to the Russian provinces where she played numerous leading roles and enjoyed significant success. (Legend has it she met Anton Chekhov in Yalta in 1904 and that he appreciated her talent.) She made the leap to the United States in 1905 (the year of the first, failed, Russian Revolution). She threw herself into studies of English and, by 1906, debuted on the American stage, performing the title role in Hedda Gabler in 1906. According to one Russian online biography, Eugene O’Neill was so taken by Nazimova’s performance that he attended the show ten times. Her fame grew so quickly that she was invited to visit Teddy Roosevelt in the White House during the time of his presidency. True fame came knocking, however, when Hollywood called. She made her first film in 1915 (War Brides), but the real start to her career took place in 1918 when she appeared in three films. 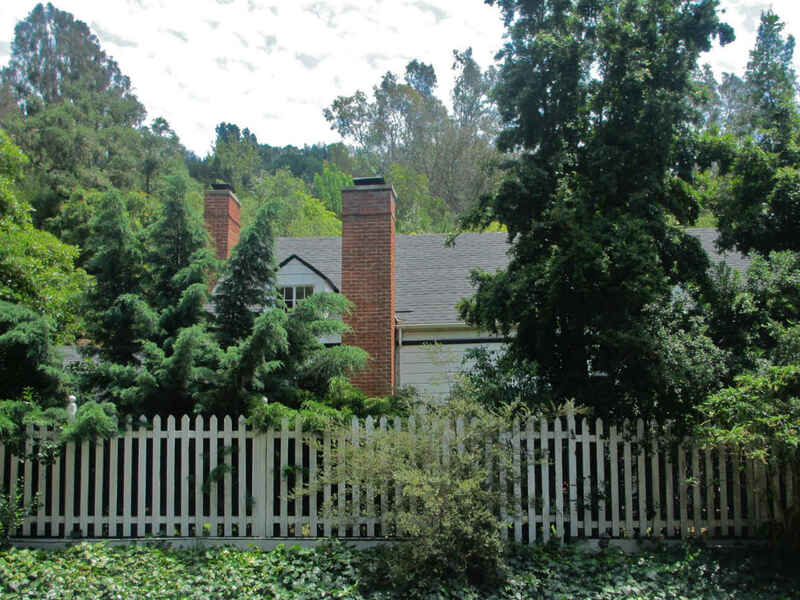 Her golden years as a Hollywood actress coincide with the period (apparently) when she stayed at the home pictured here. She played the leads in Camille (1921), A Doll’s House (1922) and Salome (1923), confirming her reputation as an exotic beauty and a powerful actress. It is worth noting that between 1918 and 1923 she was also a producer and writer, wearing one or both of those hats in eight of the films she made as an actress. By 1925 her film career, which lasted barely a decade, was virtually over. She performed in three films in the 1940s, but that was another era and another level of art. Nazimova’s legendary Garden of Allah estate and hotel (along with her swinging sexual escapades) are now more famous than Nazimova herself. The extravagant structure and beautiful grounds attracted virtually everyone in the Hollywood elite in the 1920s. The Wikipedia article on the location provides a list of some 75 A-list celebrities who lived in, or stayed at, the hotel at one time or another. Although Nazimova never returned to Russia after she left in 1905, when she had a swimming pool built at the Garden of Allah, she may have had it done as a copy of the Black Sea, alongside which she was born. I make that weak claim, however, and must immediately admit that there is still argument as to whether this is true. A lovely internet article tells the story of the pool with plenty of juicy detail (John Barrymore supposedly held the record for falling into the pool; and, “Marlene Dietrich and/or Tallulah Bankhead were said to like to swim in it at night naked except for their jewelry”). There is virtually nothing left of the Garden of Allah these days. It was bought by a benighted banker, Bart Lytton, in 1959 and he razed it in order to build his bank’s headquarters there. I remember seeing a video on the internet a year ago, when I began researching Russian addresses in L.A., that took viewers down into a basement in one of the businesses now located there, and revealed a couple of tiles or something similar from the original Garden. I don’t find that video now, but it’s out there. If some intrepid one among you finds it, you can post the link below. 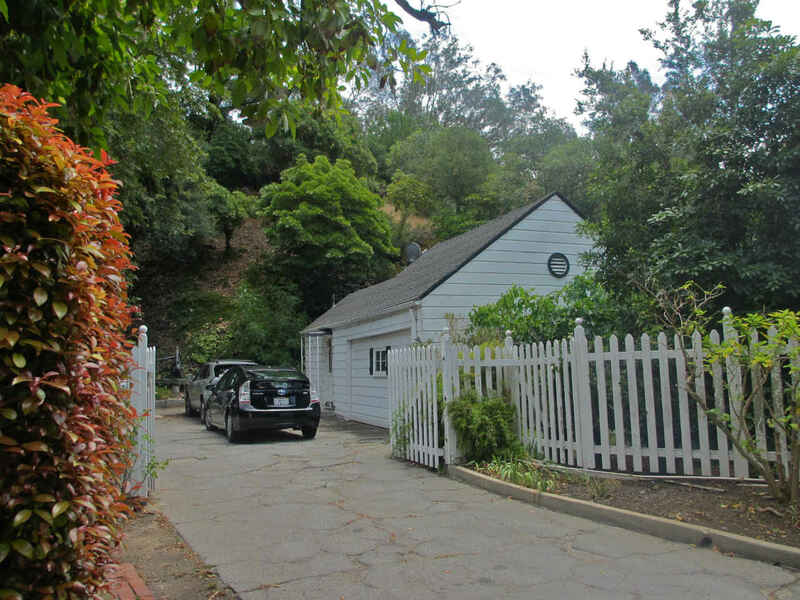 As such, in a curious sort of way – this house at 1000 Stone Canyon Rd. is one of the closest, tangible links to Nazimova’s Garden of Allah. Because, chances are, it was while she was here that the planning and building of the Garden took place. For the record, according to the Movieland Directory, she had a total of three other L.A.-area addresses during the 1920s: 649 W. Adams Blvd. (unspecified 1920s); 1438 Hayvenhurst Dr. (1924-26); and the Garden of Allah at 8152 W. Sunset Blvd. (the address was actually 8080 at that time). The Movieland Directory suggests that Nazimova moved into the Garden of Allah in or around 1930, but I think it’s safe to say she did so earlier – probably 1926 or 1927. I am assuming that Stone Canyon was the first of those address. It would make sense that she lived here temporarily before moving into more permanent quarters, but this is just my conjecture. Dmitry Shostakovich made two trips to Voronezh, one in 1933, and another in 1957. It’s an interesting spread in time. When Shostakovich performed at the Spartak cinema house on Dec. 20, 1933, with Vissarion Shebalin, he was still probably something of an unknown outside of musical circles. Among the cognoscenti he was already tabbed as one of the potentially great figures of the future. In any case, at that moment he still saw a cloudless sky stretching out before him. His works were being performed with increasing success in the West and throughout the Soviet Union, he was collaborating with such luminaries as Vsevolod Meyerhold and Vladimir Mayakovsky. It was just over two years later, on Jan. 28, 1936, that the famous “Muddle Instead of Music” attack – provoked by Joseph Stalin – hit him in Pravda, one of the Soviet government’s two main mouthpieces. 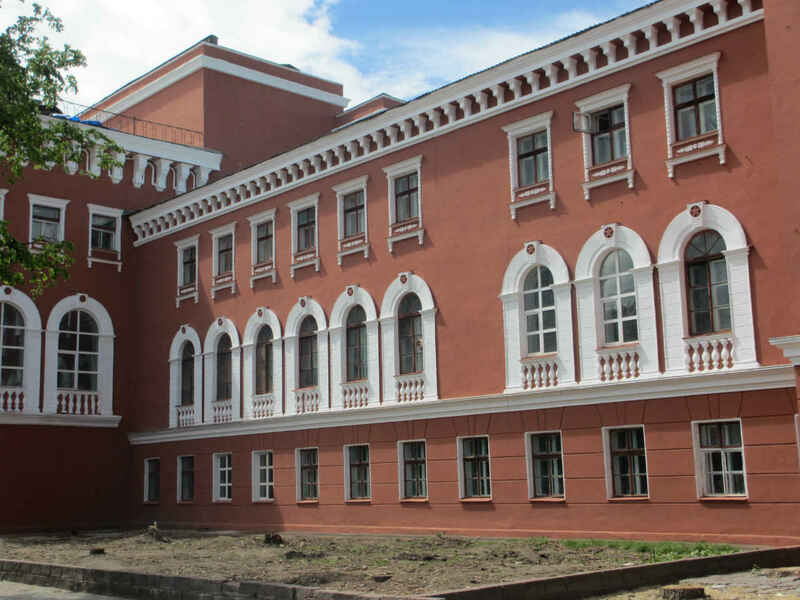 That came as a response to Shostakovich’s opera Lady Macbeth of Mtsensk, which was written in the two years immediately before the composer visited Voronezh, but premiered (in St. Petersburg) just one month after that visit, on January 22, 1934. By the time of his 1957 Voronezh concert on Oct. 11, Shostakovich was a veteran of the Soviet culture wars. He had been chewed up, wrung out, spat out and fully embraced by the government apparatus (one of the worst things that could have happened to him). By this time he had, in other words, two contradictory reputations – one as someone who had run afoul of the authorities and had suffered seriously for it, and another as someone that the authorities had taken under their wing and used as propaganda whenever and wherever they saw fit. It was a nasty place for an artist to be and it – to use that horrible word that Pravda threw at him – has “muddled” his reputation ever since. 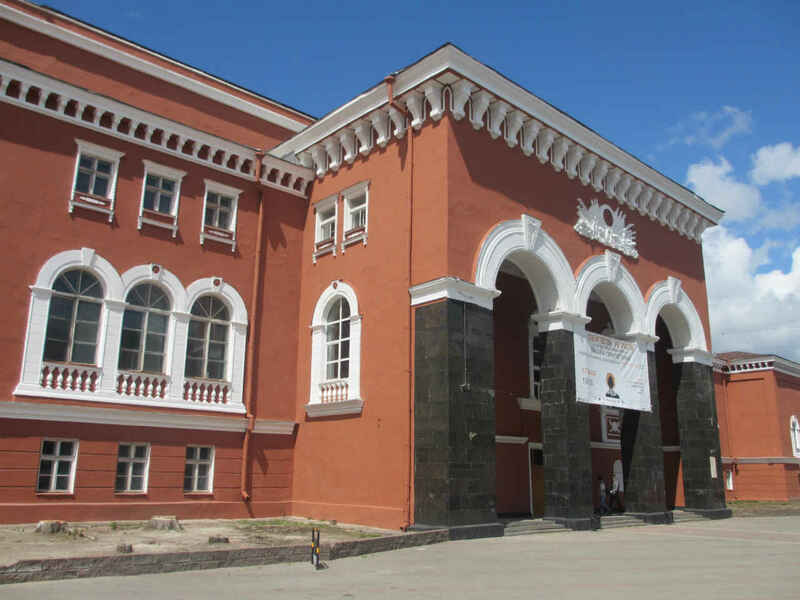 The hall which hosted the 1957 concert was, and still is, the Officers House, located at 32 Revolution Prospekt. Shostakovich conducted an orchestra that played his compositions, although I have not determined what those works were specifically. Without quoting Rostropovich verbatim, Vesti.ru reported that the great violist recalled the difficult circumstances in which Shostakovich had to live and work, although he added that the harassment of the Soviet state and the official banning of his concerts never broke Shostakovich’s innovative spirit. 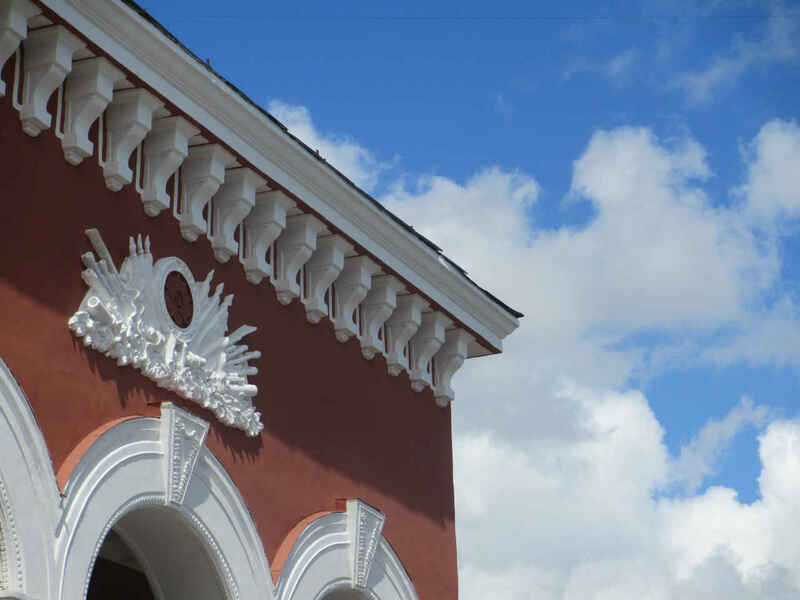 I direct those interested in minutiae to the official Voronezh city document that set the unveiling of the plaque in motion, the Resolution No. 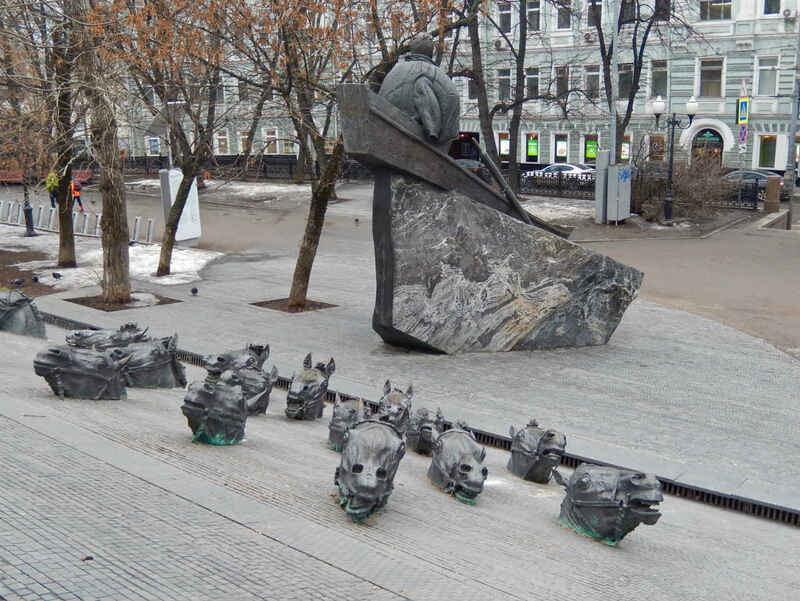 2117 of the Head of the City Region of the City of Voronezh, dated Dec. 21, 2005, and officially titled: “On the Mounting of a Memorial Plaque Honoring D.D. Shostakovich.” This document, signed by B.M. 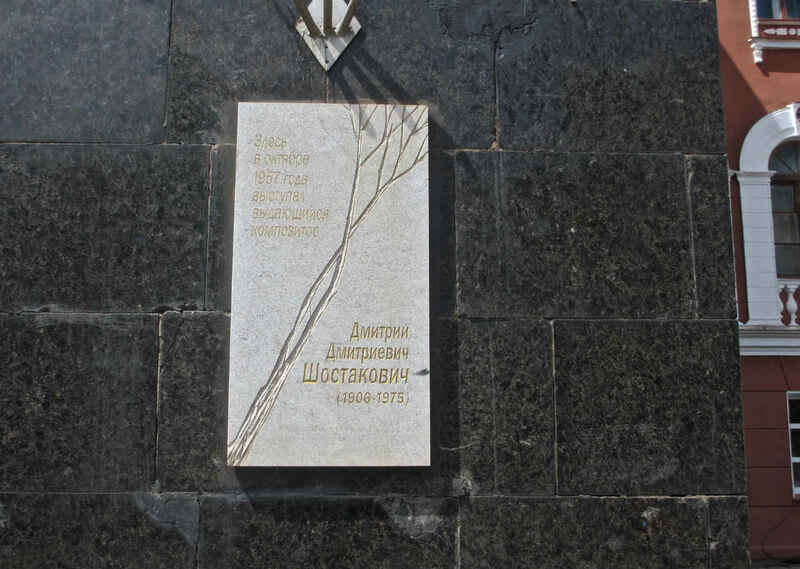 Skrynnikov, the Head of the City Region, establishes the place where the plaque shall be hung, what shall be written on it (“The great composer Dmitry Dmitrivich Shostakovich [1906-1975] performed here in October 1957”), and who shall pay for it – the Voronezh region NTV television channel. Oh, watch out for those slippery vermin – thieves, crooks and shysters! 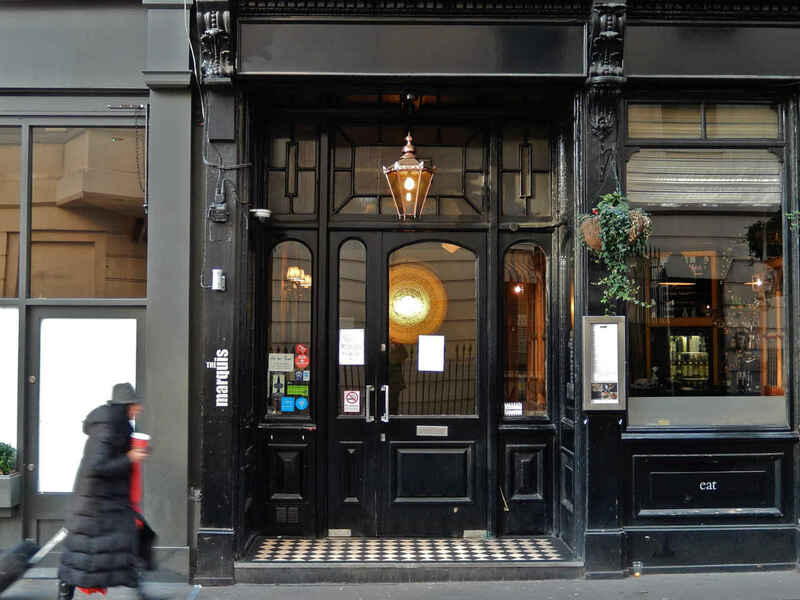 This pub at 51-52 Chandos Place in London knows of what it speaks. Over the 500 years of its “chequered” existence, as the sign outside the entrance puts it, it has known all manners of greatness and perfidy. Its original owner was a mistress of the Duke of Buckingham. It was a thieves’ den, the original Hole in the Wall. 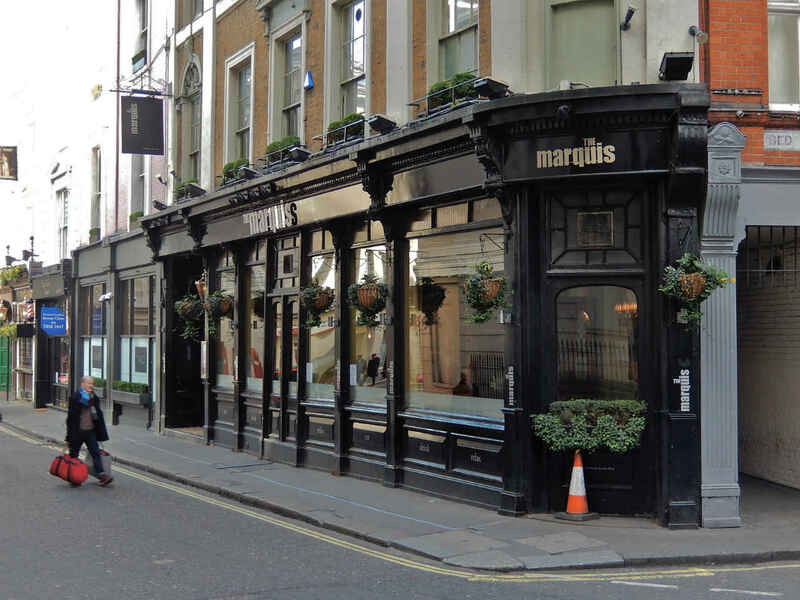 And it was a place frequented by Charles Dickens. What has Fyodor Dostoevsky to do with this? Well, nothing, actually. Nothing at all. Nothing of any kind. Unless you are inclined to be a fan of fantasy and hoaxes. And even then, I am the one making up this possible connection in a place that in no way connects Dickens to Dostoevsky. Is that clear? A few years ago a juicy story about a meeting between Dickens and Dostoevsky began making the rounds. It first appeared in 2002 in a prestigious publication dedicated to the study of Charles Dickens. It was picked up and printed in a Dickens biography in 2011 and then in other sources. In short, this unknown bit of history – an actual encounter between the great English and Russian writers – became quite the literary sensation. It came with some fun details, including Dostoevsky’s specific impressions of Dickens, and how could we not love it? I mean, Dostoevsky was quite the Dickens fan, reading him at length during his period in exile and after. Scholars have written reams about the connections between the two writers, ranging from the general of N.M. Lary’s Dostoevsky and Dickens: A Study of Literary Influence) and Irina Gredina‘s essay, “Dickens’s Influence upon Dostoevsky, 1860-1870; or, One Nineteenth-Century Master’s Assimilation of Another’s Manner and Vision” to the specifics of Allegra Wozniak‘s paper “Setting as Character in Dickens and Dostoevsky.” A brief, blog-like post on the Russia Beyond the Headlines website stacks up a long line of the similarities in the two writers’ works for those with short attention spans. 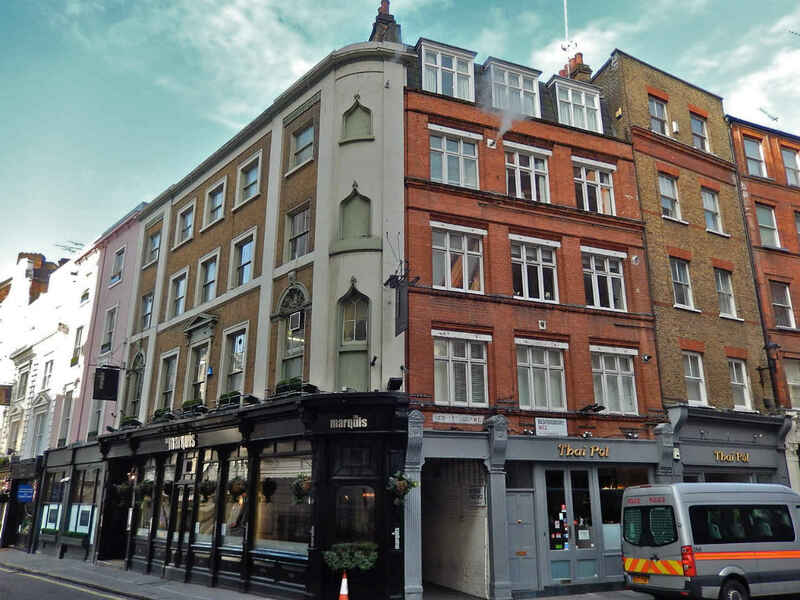 I remember the hullabaloo surrounding the unmasking of the hoax several years ago and was reminded of it when doing some armchair research before my latest sojourn to one of my favorite places on earth, London Town. We’re not talking “real” here, folks. We’re talking about how fun it is to walk the streets of a city like London and to encounter your heroes as they come to you – by chance, by thought, by imagination. 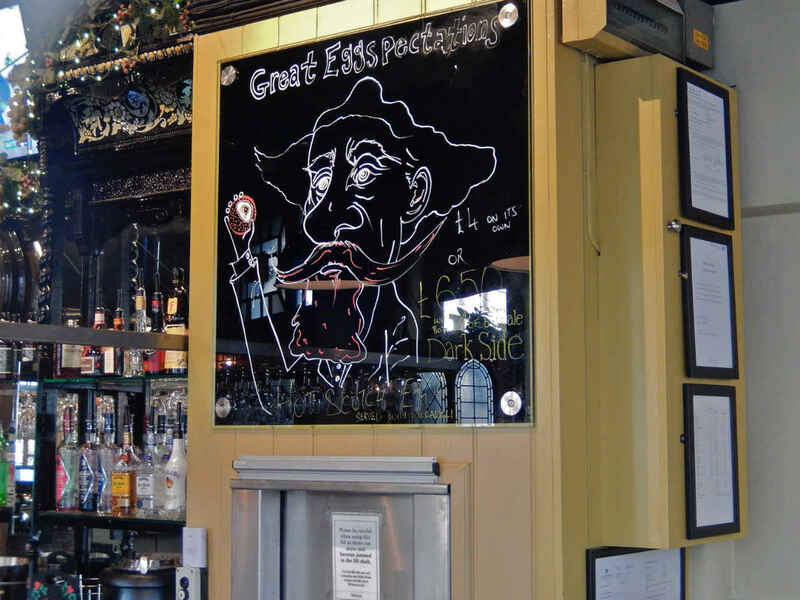 I peered in the window (see the photo up top) at the Dickens caricature and it all seemed like a dream. It was difficult to determine what was mirage and what was real. 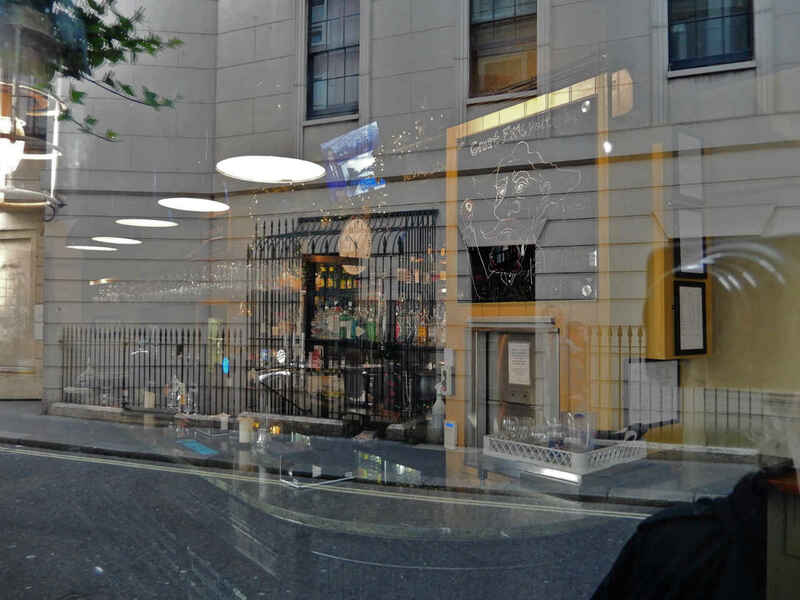 For example, the most realistic segment of that first image is actually a reflection – the stately building with the wrought iron fence in front of it. 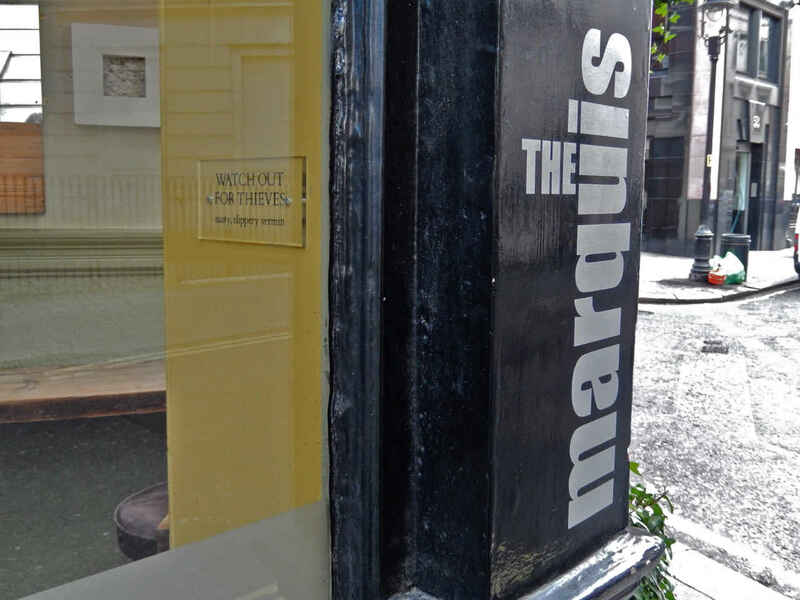 That appears reflected in the window of the Marquis Pub, right next to the warning, “Watch out for thieves, nasty, slippery vermin.” (See the second photo in the block below.) Suddenly everything I was experiencing seemed unreal, and the more unreal it was, the more it seemed like it just might be if only it really wanted to. That’s when a smile came across my face and I recalled in earnest the name of Stephanie Harvey, and her account of Dickens meeting Dostoevsky. I won’t go into detail about Stephanie or her many other guises – all pseudonyms for one A.D. Harvey (he used at least eight pseudonyms in order to plant and nurture the hoax about the D-D meeting.) You can read the first and most substantial debunking of the myth in the Times Literary Supplement. You can read Harvey’s own story, including his justification for playing the dastardly trick, in an interesting interview article in The Guardian. From there, if you’re interested, you can branch out and find all the details you crave. You can think what you want about Harvey and his deed. I, personally, can’t get too worked up over it. Maybe because I have nothing invested in it. Maybe because I love a good joke and a well-constructed myth. Maybe because I’m so used to the world throwing all kinds of nonsense at us every minute of every day, and here, finally, was some interesting and entertaining nonsense that lacked blood, hostility and humiliation. 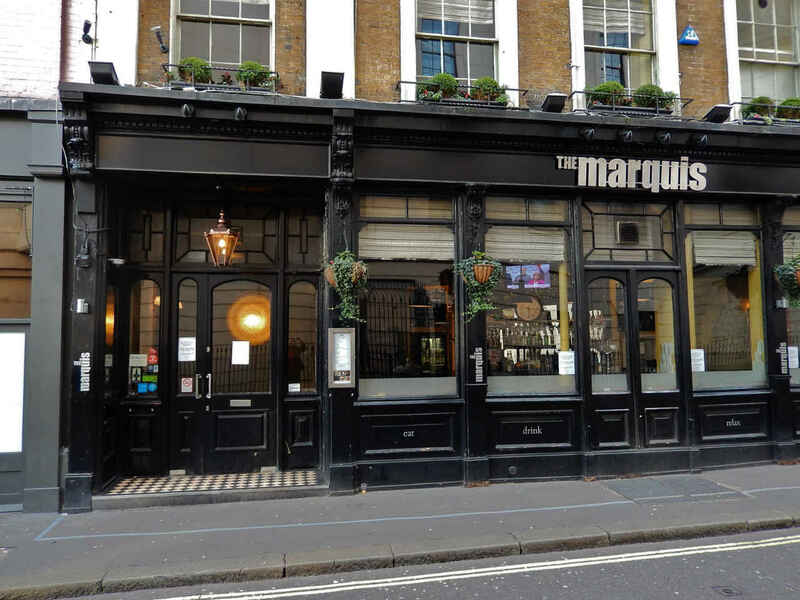 I will say this, were it not for A.D. Harvey, I would never have enjoyed my 15 minutes wandering around the Marquis Pub nearly as much as I did with his crazy concoction rattling around in my head. 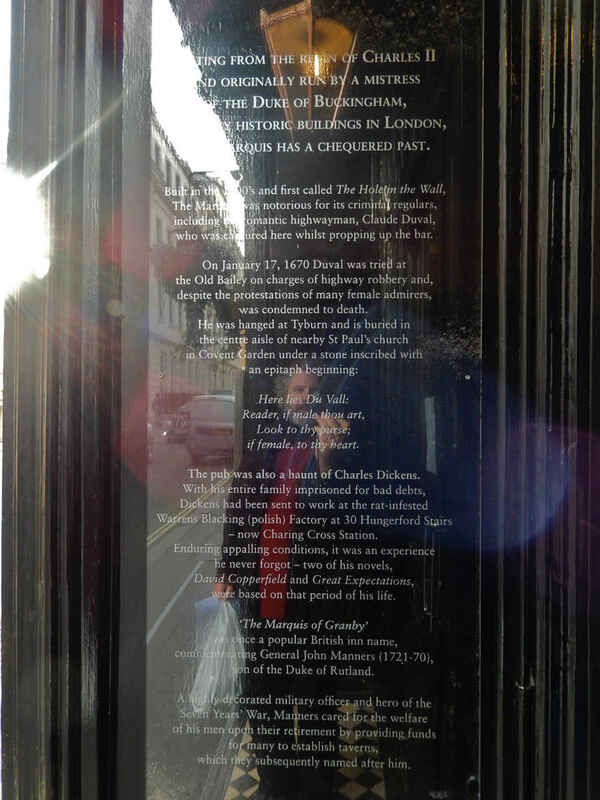 The upshot for me was this: For 15 minutes outside the Marquis, Dostoevsky and Dickens, did, in fact, meet. In my head. They were there together. And I was there to witness it. No need to print that in any biographies. Scholars, with collars too tight, may frown as they will. Readers, who participate in little miracles like this all the time, will join me smiling, I think. Take a look around these photos. You may see some ghosts. 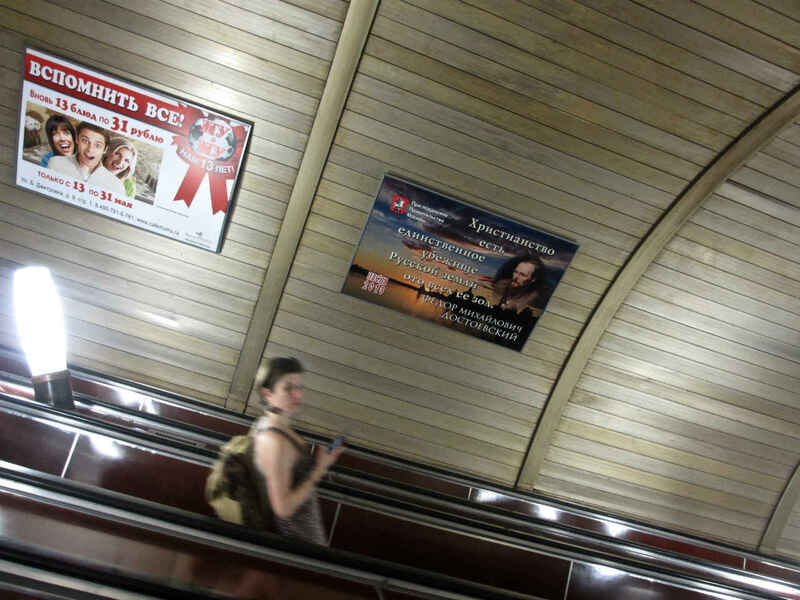 One encounters the tool of literature in the Moscow metro relatively frequently. Even when it’s not used as a club, you come away feeling as though someone is trying really hard to make an impression on you. I immediately think of two examples of this more benign, latter, approach that I encountered in recent years. 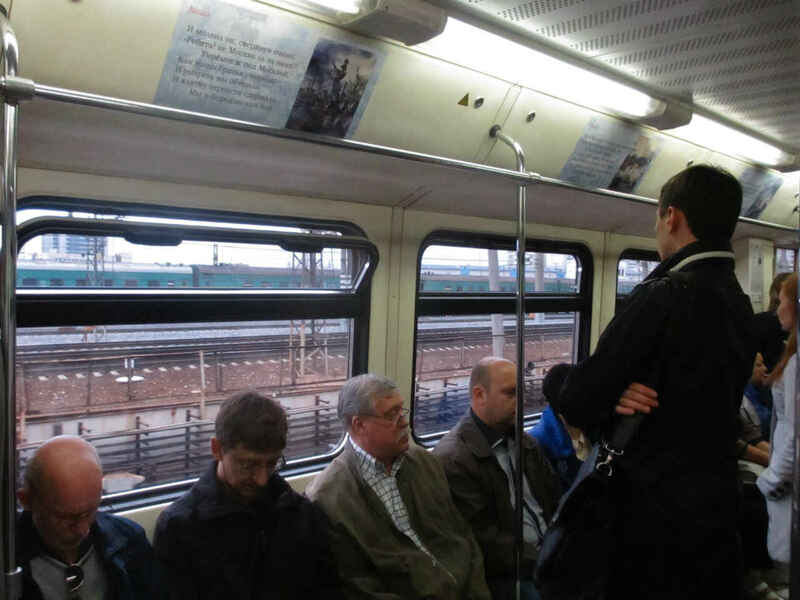 I would guess one occurred 4 or 5 years ago – this was on the circle line – the other 3 or 4 years ago, on the light blue, Filyovskaya line. 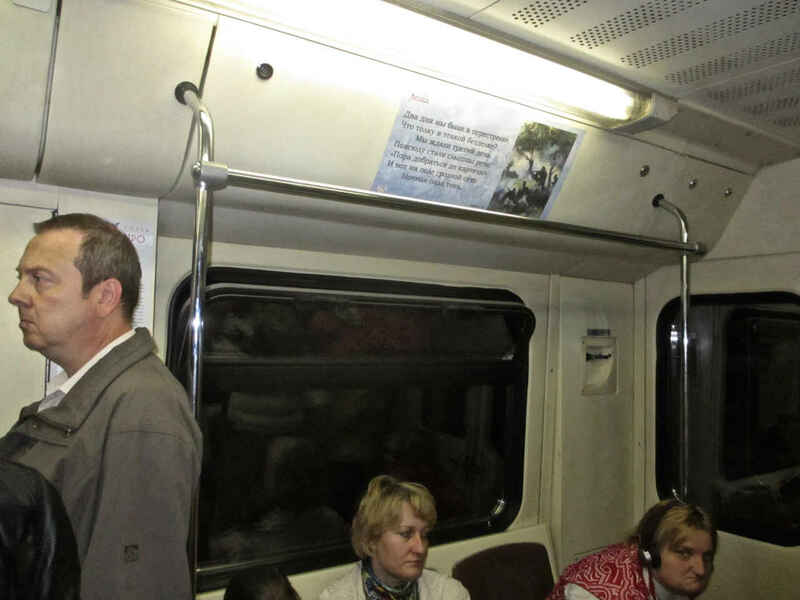 In the former case, almost every single car traveling the circle line for a month or more was completely wallpapered with children’s poetry and colorful kid-like drawings. Stepping into a car on that line at that time felt like stepping into the hermetic set of a children’s theater show. 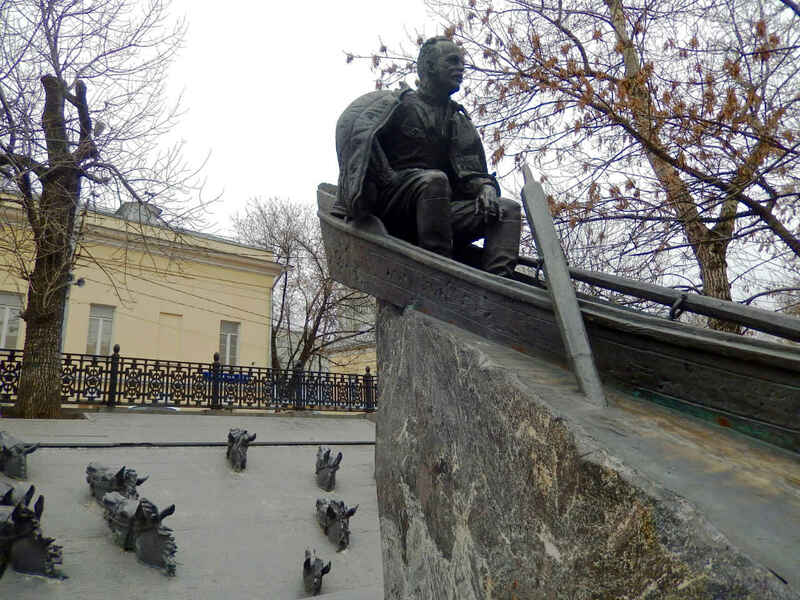 As one might imagine, there were a lot of poems by Alexander Pushkin and the great fabulist Ivan Krylov, but there were also excerpts of short stories by various writers from Pushkin’s time up to the middle of the 20th century. I couldn’t possibly remember them all, and I don’t think there were any contemporary authors, but the scope of writers included was impressive. Frankly, as often as I have seen this kind of crude utilitarianism in my 28 years in Moscow, I continue to be astonished when I encounter it. It reaches the kind of low-blow propaganda – rather on the level one hears in the U.S. these days from, say, Donald Trump, Ted Cruz or Sarah Palin and their ilk – that is so blatant and transparent, that you can’t believe anyone would actually resort to it. For the record, this particular quote is offered up as part of a program called Russia, My History, which is now underway at the Historical Park of the All-National Exhibition of Economic Achievements. “Men! Isn’t Moscow behind us? During the Battle of Borodino. Perhaps my favorite photo is the one immediately above. Click on it to enlarge it and then look it over well. 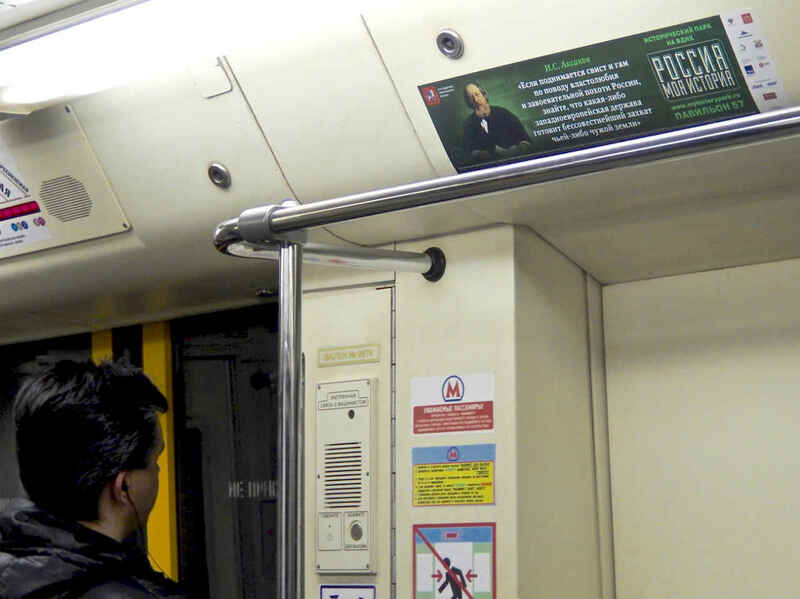 That’s what a subway car in a time of “petty,” “dirty” wars looks like. I don’t recall now if the Solzhenitsyn and Tolstoy quotes were as provocative (or as double-edged) as this one, but this clearly made me want to save it for posterity. There is something of the train wreck in these things. Something lurid, distasteful, obnoxious and impossible to ignore. The problem is that when art is turned into a weapon it can only be a weapon. There is no room then left for art.